We cordially invite you to come and explore this part of town in person. 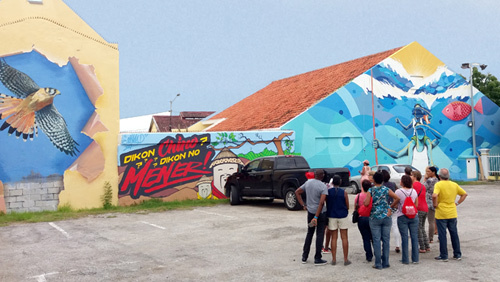 Scharloo Abou is slowly turning into the creative district of the island and it sure is a special part of Curaçao. Where old meets new and where living, leisure and business are thrown in the mix. 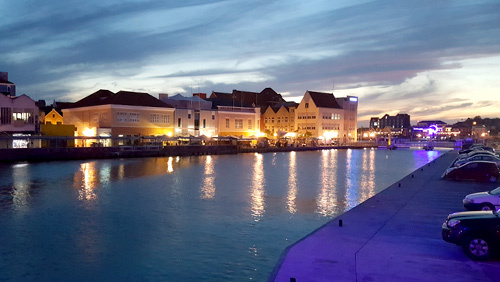 It is easy to combine with a shopping spree in Punda city centre across the bridge. If you book your stay in Scharloo Abou it is within walking distance to the entertainment district Pietermaai and the cultural district Otrabanda. Meet up with friends and have a lovely breakfast or local lunch and get your daily dose of inspiration just by crossing the street and looking around! Scharloo Abou is the backdrop of many activities happening on the island, more than you might think! Most locals have been to numerous events and happenings on the Kleine Werf, which is actually part of Kop van Scharloo. Or have you ever visited a seminar in Villa Maria or a party in Tutu Tango, Bermuda, Districts 1850 or what it is now called Urban Venue. It’s also a new style gym where you can workout. 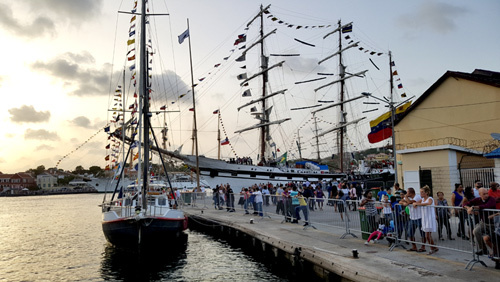 CPA organizes multiple worthwhile activities and events here, like the annual Marine Dagen or the latest Velas Latinoamerica. Catched a movie at The Movies? All of that is part of the district of Scharloo Abou! So you might not have been completely aware of this before, as the location is often not promoted as Scharloo Abou, but you might have been spending more time in this district than you realise. Besides the popular bigger events and activities there have been more and more new upcoming events taking place right in the middle of Scharloo Abou. Like the cozy Sunset Sessions by Street Art Skalo, bringing people together through the art pieces while in the making. Or remember when the popular local-crafts-market-on-the-move: Passionistas celebrated their 1st year anniversary at Villa Maria? The band Kuenta i Tambu and Dj Hardwell also rocked the dance floor in Villa Maria! And Hello Skalo has been very active in and around Parke Leyba, with a range of successful first editions of a Foodies Fest, a Kings Day celebration, a Christmas fair and more. Activities which all are meant to become annual returning events. The ScharlooAbou.com online platform will be a medium to communicate all the different things that are happening in the district in one central place. So come back frequently to stay up to date, follow us on Facebook and Instagram or feel free to sign up for our newsletter. Through these mediums we will keep you up to date on upcoming events, activities but also new developments or opportunities? While passing through the district you will notice a strong contrast between beautifully restored monuments and old mansions in decay, but in between you will now also be surprised and astonished by colorful art pieces adding to the excitement of the neighborhood. So far Street Art Skalo curated talented local artists to make these art pieces. These murals & art pieces have helped to really turn the spotlight on Scharloo Abou. The beginning has been made and it shows what more art can do for the neighborhood. Read more about the initiative, the art pieces and the artists. 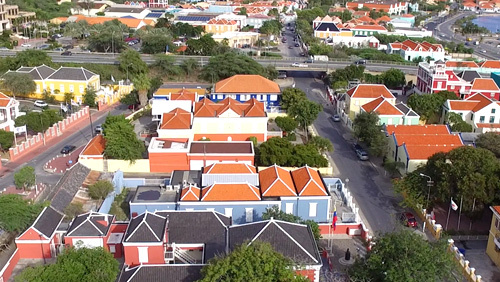 Scharloo Abou has been on a long path of revival after the area fell in decay, a development that Monumentenzorg and Stadsherstel have put their heart and soul into and one that Curaçao can be proud of. Within this historical district you will find one of the highest density of monuments that are cared for by Monumentenzorg and Stadsherstel. Both organizations are also housed in 2 of the most stunning monuments in the neighborhood. In the part about the history of Scharloo Abou you can read more about how the district developed over the centuries and how the monuments came about. In the future we wish to highlight each and every monument with a detailed story and exclusive footage. Want to know when we start with those series, then sign up for the newsletter! Scharloo Abou counts a handful of places to eat, drink or to have a dance. Though with all the changes and improvements also that is changing for the better. Entrepreneurs are rediscovering the district and are seeing its potential. A few entrepreneurs have opened new lunchrooms and there is room for more growth in this food & beverage sector. Basically there are now only 3 food options at hand. Each with their own flair and specialties, but all well worth a try! First came Kushina di Flor, specializing in local dishes open only on weekdays and only for lunch. They are situated in the neighborhood centre of Fleur de Marie, it’s a short walk that will take you uphill along colorful little houses and streets taking you deeper into the lovely barrio with its local flair. The lunchroom is located in the “centro di bario” which is a newly designed building with a tropical island feel, where the island breeze flows freely through the building. It is frequently visited by locals from the neighborhood as well as business people looking for a affordable local lunch. The friendly staff will surely make you feel at home. Then came Beyglz in 2016, it is the first real bagel shop on the island! Besides healthy bagels they have great coffee and the salads and wraps are also to die for. It’s a great option for breakfast as well as lunch or even take out. The retro look, stylish interior and comfy seating will make you feel right at home. With enough parking space right across the street in front of the street art murals, it is easily accessible. And mid September 2018 a cute new concept store opened its doors. Fleur de Marie Eatery, right across from Parke Leyba, is a another great addition to the hood. The name might be a bit confusing as is not really situated in Fleur de Marie, but very near. They serve a healthy fusion of food, there is a little shop with local and international products and they plan on giving healthy cooking workshops. They are open for breakfast and lunch. Once upon a time Scharloo Abou was the place to be on weekends for the party people. Remember Tutu Tango, Bermuda and District 1850? Nowadays Scharloo Abou is not that much about nightlife anymore. But that might change, you never know with the ever changing developments. Scharloo Abou has proven itself as a great location for nightly entertainment, as there is enough parking space at Waaigat and it is not a or near a dedicated residential area. As for bars there are a few little local “snek” bars, offering affordable drinks and playing lots of bachata. We are proud to say that Scharloo Abou is home to one of the finest museums on the island. When you cross the small walking bridge from Punda you arrive at the front door of The Maritime Museum. It is housed in a monumental building that overlooks the floating markets and the Annabay. The collection tells the story about the maritime past of the Netherlands Antilles. 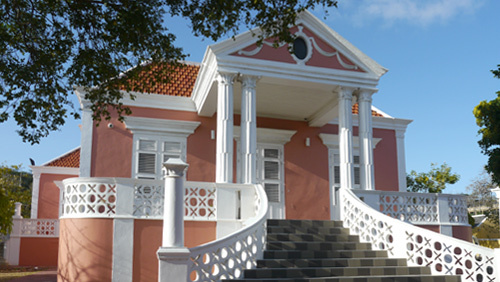 Since that entails most of our colonial history, a visit to the museum teaches you a lot about the island general history. The interior of this monument has a nautical feel and from the top level it almost feels as if you have boarded a old ship. 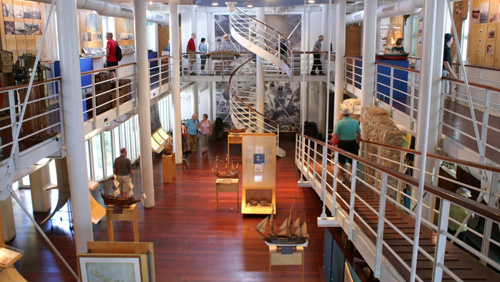 The museum is air conditioned, making it an ideal option if you want to escape the hot hours of the day. They also offer a cruise through the harbor at set times. There also used to be a coin museum, and we hope it will open again in the future. Scharloo Abou offers a great setting to open up a gallery or art shop. They are several options that would be fit to house such a concept. Up to now most tours offered are walking tours. That is most likely also the best ways to experience the uniqueness of this district. In this district several guided tours are offered by independent tour companies or individuals. In the past few years the number of tours provided have increased and the number of attendees of these tours have increased significantly as well. To name a few examples Dushi Walks, Art Now City Walks and Hello Skalo offer guided tours. There are also a few tour companies that drive around in tuk-tuks that include Scharloo Abou in their itinerary. 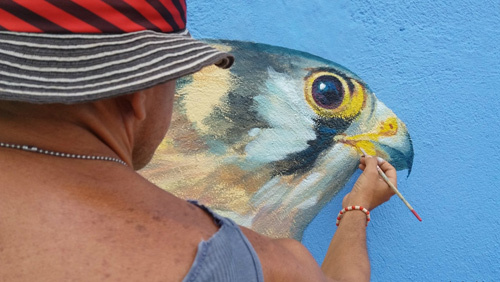 Street Art Skalo also envisions to offer their own art tours in the near future. What makes them different is that part of the proceeds will go towards making more murals possible in the neighborhood. Sign up for our newsletter if you want to know when they start with these tours or follow them on their Facebook page to stay up to date. We hope that in the future more tour companies will consider to include this special part of Curaçao in the tours they offer. We hope they realize that they can play part in the development of a district. Because by bringing more tourists it can flourish even more. Up to now most bigger touring organizations have not been very supportive. For example the little pink tour train only passes through to get to Scharloo and unfortunately they haven’t changed their route to include a little detour through Scharloo Abou. The big tour companies have often replied that they cannot add a stop-over or drop-off in Scharloo Abou as they believe that “there is still not enough to do and see in the hood”. We believe that there is already a fair amount of things to do and see and that when the big tour companies start coming a natural spin-off is that more things will come. Its giving and taking and together you can make it grow. What is enlightening is the looks on the faces of the tourists in the train and busses, saying “oh” and “ah and swiftly grabbing their phones and cameras to point and shoot, when the busses pass the perfectly visible grand mural of the yellow “kibrahacha” tree when taking the corner to head towards Scharloo! It is a great feeling to know that that split second was among the highlights of their tour! Scharloo Abou is perfectly fine and safe to explore by yourself if you wish. You will enjoy all the beautiful sights to see, although a guided tour will probably give you more background info and a deeper look into the history. As of now you can also use our online platform as a basic guide. 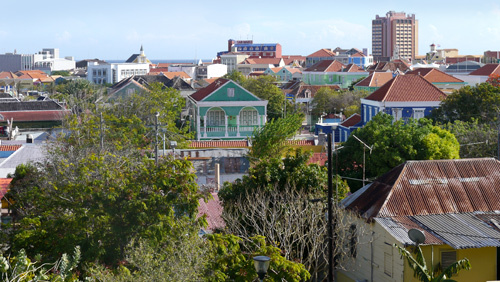 A growing percentage of cruise tourists visiting Curaçao also enjoy sightseeing in Scharloo Abou. As most tour companies don’t include Scharloo Abou yet, they come by foot. From the mega piers in Otrabanda it is still a doable walking distance. The visitors that come for sightseeing here are often the more adventurous ones or the ones that like to get off-the-beaten-path. Because that is just what Scharloo Abou offers; a mix of history, art and a local feel. How did they find out about this “hidden pearl”? Google and the internet is their best friend. The news of the uniqueness of Scharloo Abou has travelled quickly across the net through social media, blogs, vlogs and travel influencers. Visitors are keen on posting the photos in front of the murals and monuments on Instagram and Facebook. Indirectly growing curiosity and guiding people to the area. There are not many places to stay in Scharloo Abou, not yet..who knows what the future holds. Actually there are only a handful of AirBnB options for short stays right now. The most remarkable one is probably the one housed in the building with the big mural on the corner. Fun fact is that the bookings and interest in this accommodation has doubled since the art was made. Besides this one there are about 2 or 3 other AirBnB options can be found in the neighborhood. In the past there used to be Hotel Scharloo, but they changed their concept to offering long term stay in a cozy boutique hotel style setting. The closest hotel or hostel is probably the Ritz Hotel, located right behind the viaduct where Scharloo Abou ends and Scharloo begins. Other accommodation options lie a little further in Punda or Pietermaai. In Scharloo Abou there are a few buildings that are perfectly fit for a boutique hotel or bed & breakfast. There are also a few options which investors could consider if they are looking for a location for a small to medium sized hospitality concept. The real estate plan of CPA for Kop van Scharloo is also taking stay-over tourists into account. Read more about opportunities in Scharloo Abou.